I’m really bad at coming up with short recipe names. I thought about calling these “The Absolute Best Frozen Dessert The World Has Ever Seen”, but that seemed a little too wordy. 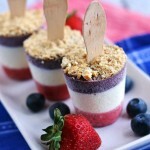 Boozy Red, White, and Blueberry Cheesecake Popsicles was shorter– by a margin– so I went with that. You can call them whatever you want though, because it all sounds like gibberish when you’ve got a mouthful of poptail. Now, I’ve gotta tell ya, these don’t taste much like alcohol at all. 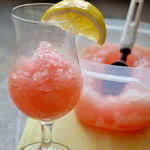 Unlike the Creamy Margarita Popsicles I made last year, these don’t feature a strong alcohol that really brings out the flavor. Instead, Rumchata (or Bailey’s, if you’d prefer) just gives a hint of booziness to these very tasty popsicles. You don’t want the liquor to overpower the cheesecake or fruit here! Oh, and if you’d like to make these alcohol-free, feel free to substitute milk for the Rumchata. Nah, sounds like too much work. Instead, I’ll give you the recipe, out of the kindness of my heart. Or the laziness of my soul. Whichever you prefer. 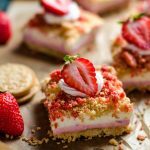 These would be great for Memorial Day Weekend, the 4th of July, summer BBQs, Labor Day Weekend, or just to keep in the freezer and enjoy after a hot day. I know I have one left waiting at home for me and I am absolutely going to dig in when I get there. That is, if my mom hasn’t eaten it. First, make the simple syrup. Combine the sugar and water in a saucepan over high heat. Bring to a boil, stirring occasionally, until the sugar has completely dissolved and the liquid has thickened slightly. Simmer for 5 minutes and then remove from heat. Let cool. Next, add the strawberries, 1/4 cup simple syrup, and 2 tablespoons Rumchata to a food processor or blender. Pulse until smooth. Distribute the strawberry mixture evenly amongst the 10 paper cups. Place in the freezer for at least one hour. Rinse the food processor and combine the blueberries, simple syrup, and Bailey’s. Pulse until smooth. Place in the refrigerator until ready to use. In a large bowl, cream together the cream cheese, sweetened condensed milk, and Rumchata. 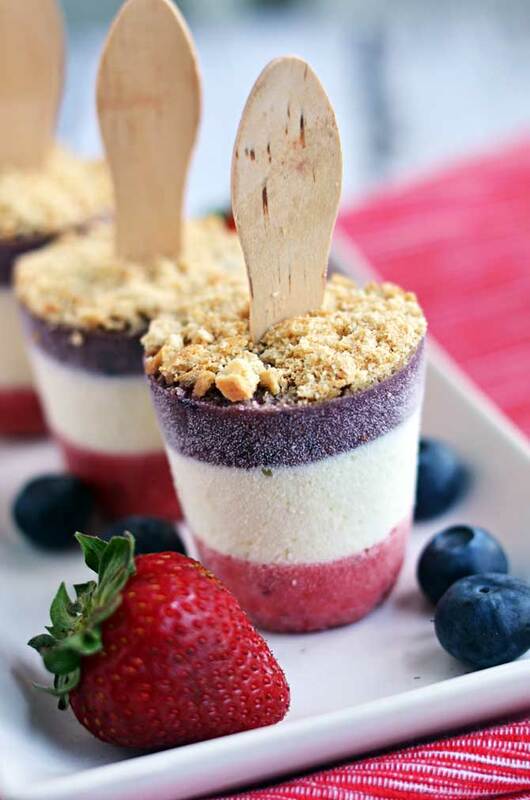 Scoop or pour into the chilled paper cups on top of the frozen strawberry mixture. 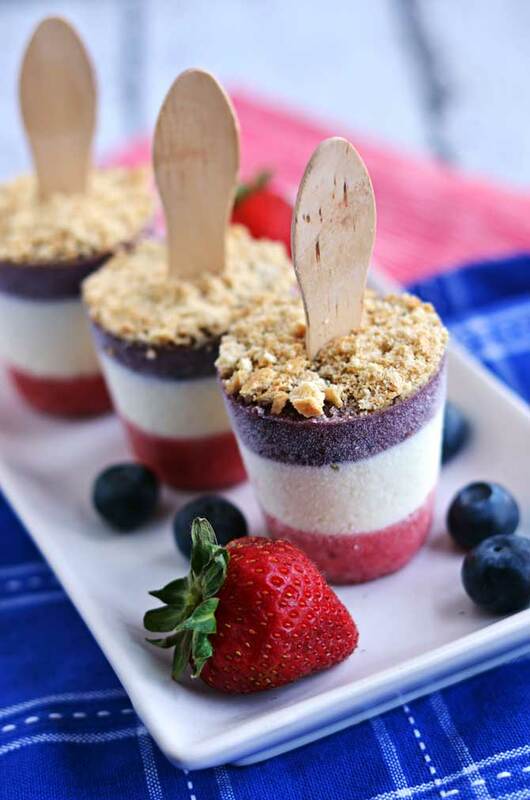 The cups should be 2/3 of the way full after adding in the cheesecake layer. Freeze the cups for 30 minutes, and then press a wooden craft stick into the center of each cup. Freeze for at least an additional 30 minutes. 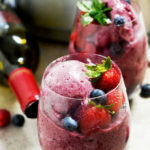 Pour in the blueberry mixture and freeze for 30 minutes. 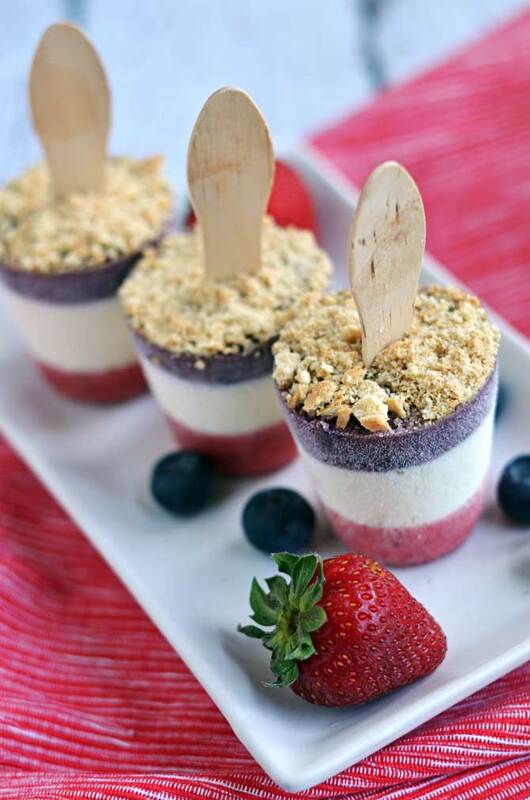 Then, sprinkle the graham cracker crumbs on top of each popsicle and freeze again, for at least 6 hours or overnight. 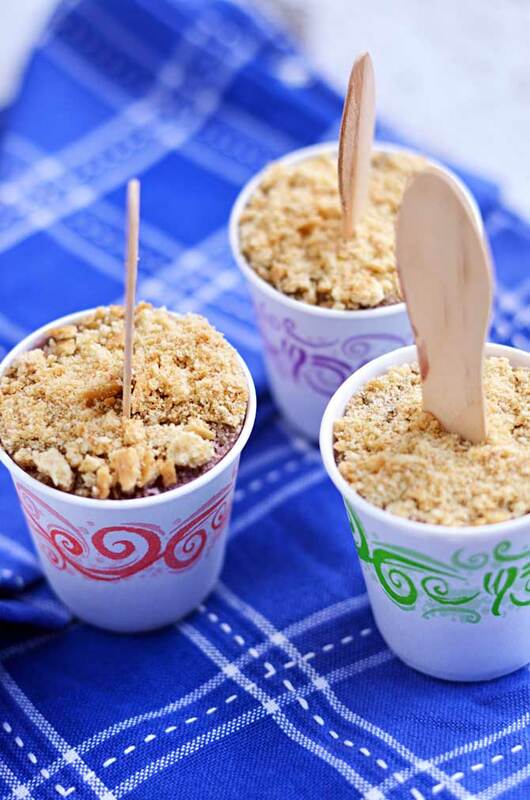 When ready to eat, peel away the paper cup and enjoy! I must say 1. These look amazing…and 2. 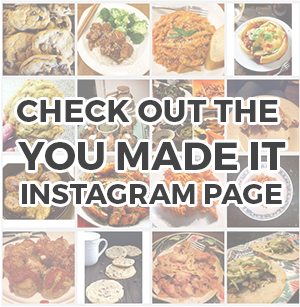 I’ve only looked at 5 pages of your blog and EVERY single recipe looks freaking amazing!!!!!!!!!!!!!! I can’t wait to try them out. Thanks. These look amazing! Do the graham cracker crumbles stay on when you invert the Poptail? The best way to get the graham cracker crumbles to stay on is to press them down lightly into the popsicles when you’re sprinkling them on, before the popsicles are entirely frozen. This way, they freeze into the bottom of the popsicle and stay on when you flip them upside down to eat them! Does the homemade simple syrup differ from store-bought simple syrup in terms of sugar to water ratio? 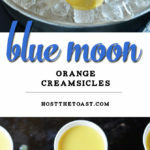 I don’t have a stove, so I’m wondering if I could use pre-made simply syrup instead! Thanks! So happy to hear that they were a hit! Thanks for letting me know, and I hope you had a great 4th! These are really cute.I would like to make these. All of these are So perfect for the holiday and they look delicious.